In Taiwan, the migrant Filipino Catholics have organized fundraisers in the various parishes. Taipei sends two plane loads of essential aid . In the coming days the U.S. aircraft carrier George Washington and a Royal Navy warship will arrive to speed up rescue operations. The UN, Australia and the European Union also offer aid. Taipei (AsiaNews) - Taiwan, the United States, Australia, the Catholic Church, the UN and other international agencies are allocating aid to the victims of Typhoon Haiyan which hit the central part of the Philippines on 10 November last wiping out entire villages and causing at least 10 thousand victims so far. The Catholic communities of Taiwan , home to thousands of Filipino families , have given way to a fundraiser in parishes and organized prayer vigils for the victims . The Archdiocese of Taipei in collaboration with the Church of St. Christopher, the parish of reference for Filipino migrants , is collecting donations for the people affected by Typhoon Haiyan . Following the example of the Archdiocese other parishes in the country are holding fundraisers in solidarity with the people devastated by the disaster. Fr. Mark is a Filipino priest resident in Hsinchu. He told AsiaNews that his parish has already started collecting among his countrymen donations to be sent to the survivors of the typhoon. He also points out that many Taiwanese have rallied shocked by the images broadcast on television: "They know that the Catholic Church in the Philippines is close to the poor and to the families of the victims, this is why they come to us to make their donation". Rita is a young Filipino originally from the province of Leyte , among the most affected by the tragedy, who currently lives in Taiwan. The woman says that her "family miraculously escaped the tragedy, but I pray for all my friends, many of whom instead have dispersed among their loved ones". "That area - adds Rita - is very poor, the typhoon has caused a real catastrophe". Today Valerie Amos, UN Under-Secretary General for Humanitarian Affairs, launched an aid campaign to raise about 301 million US dollars. According to UN figures, at least 11 million people have been affected by the fury of the typhoon, which blew with gusts exceeding 300 km / h. The first reports have revealed that entire towns and villages were destroyed, with all trace being lost of some. In the most affected areas, among them the province of Leyte, there are more than 670 thousand displaced people. 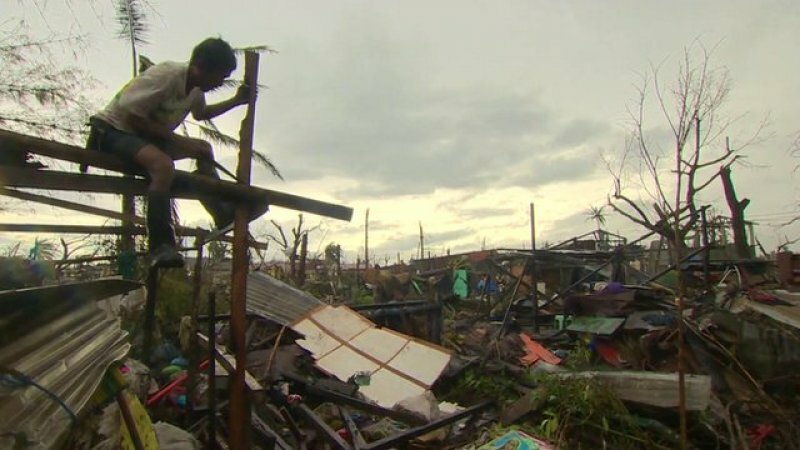 The damage caused by the typhoon, considered the strongest ever to have struck the Philippines, have forced Benigno " Noynoy " Aquino , Philippine president to declare a " state of national calamity ." One of the first governments to respond to the call for help was to Taiwan . Taipei has so far sent about 200 thousand U.S. dollars (149mila euro ) for immediate assistance and two C-130 Hercules aircraft took off this morning with a load of essential aid. Through the Pentagon, the United States announced the dispatch of the aircraft carrier George Washington to the Philippines carrying 80 aircraft and 5 thousand men who will join the rescue operations, in many cases impossible by land and sea because of impassable roads and destroyed ports. The U.S. has also set aside for now about 20 million dollars (14 million euro) in humanitarian aid. The United States has one of the largest communities of Filipino migrants with more than 2 million people . Britain, Europe Union and Australia also responded to the request for aid launched by the Aquino government. Yesterday, British Prime Minister David Cameron, said that a warship of the Royal Navy is already en route to the Philippines, with rescue personnel and humanitarian aid. London has already allocated 10 million sterling in basic necessities. The European Union has launched its program of support to countries affected by natural disasters, allocating about 3 million Euros for immediate aid. Australian Foreign Minister Julie Bishop said that the government has allocated about 10 million Australian dollars (6.9 million euro ) for the purchase of basic necessities to send to the areas most affected by Typhoon Haiyan . Caritas Philippines: Typhoon Haiyan tragedy an opportunity to live "the spirit of the Gospel"